In a medium bowl, stir the cherries, jícama, scallion, mint, vinegar, and red pepper flakes. Season to taste with salt, black pepper. Let the relish sit for 15 minutes and check for seasonings, adding more pepper flakes or salt as needed. While the relish sits, in a small bowl, mix the goat and ricotta cheeses. Using a pastry brush, brush toast slices with olive oil. 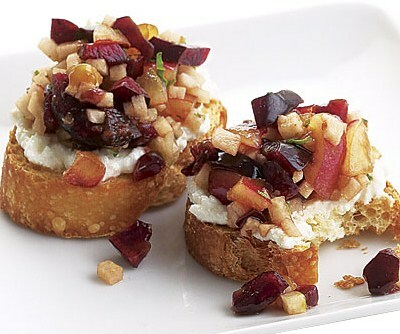 Lightly spread the cheese over each baguette toast and top with the cherry relish. To serve cherry relish with couscous, fold cherry relish into 3 C prepared couscous. Season with additional salt and pepper as needed. Garnish with lime wedges. Serve warm or room-temperature. Makes a great side dish to grilled chicken or lamb. This entry was posted in Appetizers, Recipes from Adrienne's pantry, Vegetarian and tagged cheese, cherries, cherry, jicama, mint. Bookmark the permalink.